not aware of the proper way to write an eye catching CV,this should not be taken lightly because a large number of people remain unemployed after many years just because they don't have a properly written CV or maybe they are still making use of an old CV format. In this article,we will list out some of the top 10 points that you need to observe when writing your CV in other to be able to write an attractive CV. A Curriculum vitae popularly called a CV is a summary of academic and professional history and achievements of an individual. A CV is supposed to give the recruiter or the human resources unit (HR) a quick glimpse of your academic prowess and abilities,so it's imperative that you spend hours to write a very modern and attractive CV that will secure you a good job out of thousands of other applicants seeking for the same job. 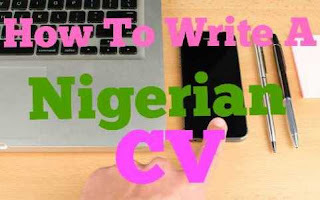 There is no specific arrangement when it comes to writing a good CV,but carefully tabulating and briefly listing out your qualifications under a different heading and subheadings is one of the modern formats for writing a good CV in Nigeria as the recruiter or HR agent will have a limited amount of time as they are also other hundreds of CV’S waiting to be reviewed. Listed below are some of the major point and formats that you should include in your Nigerian CV. information on the top of your CV,I would rather suggest that you provide this information at the middle of your CV,this will make your CV to appear interesting and unique. In this section all you have to do is to list out your goals and qualities,this shouldn't be lengthy,be precise and direct,also make sure that you arrange your CV using headings and sub headings. (Industrial Training) or during any of the holiday periods,you can also include it in your CV and indicate where,how,when and how long your job experience lasted. For those that already gained a proper work experience,endeavor to list your job experience(s) following a chronological sequence from the most recent job experience to the least recent,also you should properly indicate the name of the company where you got the experience,your designation,job description and the duration of service. You can add the valid address of the companies where you acquired the job experience(s) if you want to. Just like the name implies,this section should contain all the awards and achievements that you have bagged over the years. This section is very important as your potential employer will surely be on the look out for some of your achievements. Most current CV format in Nigeria don't come with referees,but are available on request,however it's still not old fashioned to include referees in your CV,if you choose to,just make sure that your chosen referees are well ranking professionals that you have a relationship with. (a) Don't sound too cocky or over confident over your achievement,all you have to do is to acknowledge your success and achievements and express the desire to be able to learn more and contribute to the success of the company. (b) Most CV’S are not in hardcopy but softcopy,make sure your CV size doesn't exceed 1MB and are in pdf or .doc format. (c) Modern CV’S are kept short and simple,the ideal CV should be kept at one page,however your CV should not exceed 3 pages. (d) Do not make false claims in other to boost your CV. (e) Make your CV short and interesting,avoid common words such as "highly motivated" "excellent team player'' etc be creative with your diction. (f) As explained earlier organize your CV,add headings and subheadings,also use bullet points. (g) If you must print a hard copy of your CV,make sure that you use a quality paper. (h) Check and cross check if your CV has any grammatical error,give your CV to your friend(s) to proof read. 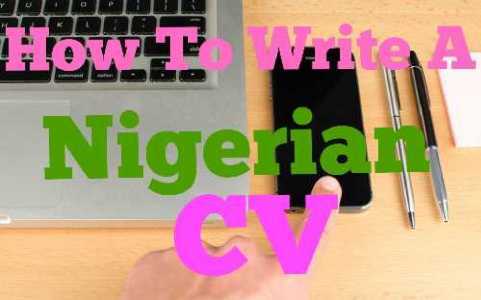 (i) You can also quickly edit your CV before applying for any job,also endeavor to include some industry related words when applying for a specific company. (j) Make sure that your CV is updated with your latest mobile number for easy contact. (k) Always sound professional in your CV,include your email address that sounds official i.e that includes your surname and first name example AdaOkoro@gmail.com,don't use an email address like BadGirlAda1996@gmail.com in your CV. (l) Most modern Nigerian CV’S also has other social network Id's such as Skype and LinkedIn,you should consider including more details in your CV. (m) Avoid writing about your family history and other irrelevant topics. (n) Make sure that indicate your leadership skills,local and foreign languages that you can speak under the skills heading. (o) Be specific about your hobbies. Try as much as possible to write a unique and interesting CV that is personalized to fit your personality and also highlights your achievements,goals and abilities.